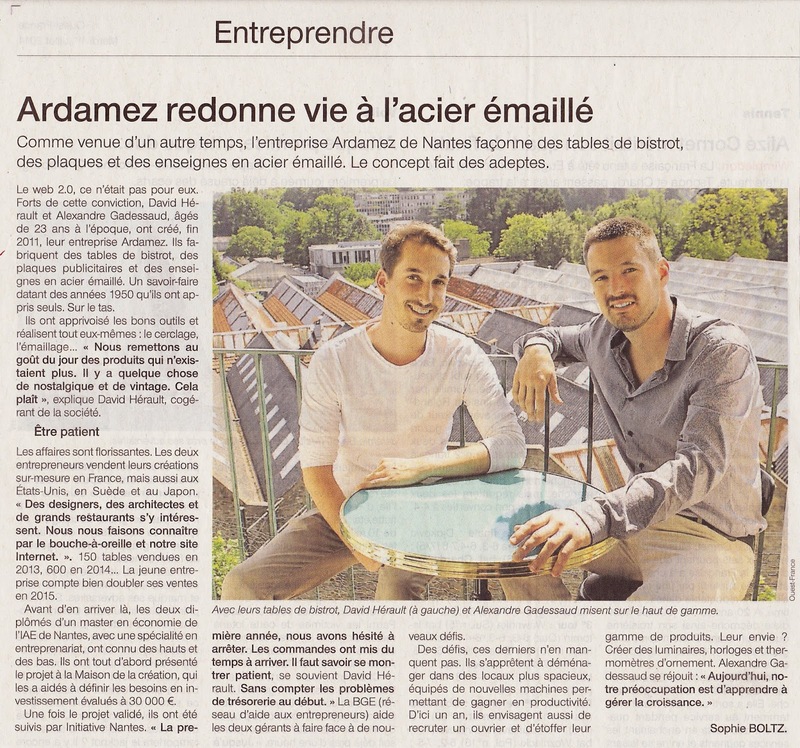 Ardamez • Blog: The french press speak about us! The french press speak about us! Web 2.0, it was not for them. With this conviction, David and Alexander, aged 23 at the time, created in late 2011, their company Ardamez. They manufacture bistro tables and advertising enamel signs. Know-how from the 1950s they have learned alone. They tamed the right tools and realize everything themselves: strapping, enamelling ... "We are putting up to date products that no longer existed. There is something nostalgic and vintage. It pleases, "says David Hérault, co-manager of the company. Business is booming. The two entrepreneurs sell their creations tailored in France, but also in the United States, Sweden and Japan. "Designers, architects and great restaurants are interested. We get known by word-of-mouth and our website. ". 150 tables sold in 2013, 600 in 2014 ... The young company intends to double its sales in 2015. Before arriving there, both graduates of a master's degree in economics from the IAE of Nantes France, with a specialization in Entrepreneurship, have had their ups and downs. They first presented the project to the "Maison de la création", which helped to define investment needs estimated at € 30,000. Once the project is approved, they were followed by "Nantes Initiative". "The first year, we hesitated to stop. Orders have been slow to arrive. We must learn to be patient, remember David Herault. Besides cash flow problems early. "The "BGE" (support network for entrepreneurs) helps both managers face new challenges. Challenges, they do not lack. They are preparing to move to larger premises, equipped with new machinery to increase productivity. Within a year, they also plan to recruit workers and expand their product range. Their desire? Create lighting, clocks and thermometers ornament. Alexander Gadessaud rejoices: "Today, our concern is to learn to manage growth. "